Early autumn is one of my favourite times of year to be in the kitchen, cooking away the end of summer blues and knowing there will be lots of homemade goodies to indulge in over winter. 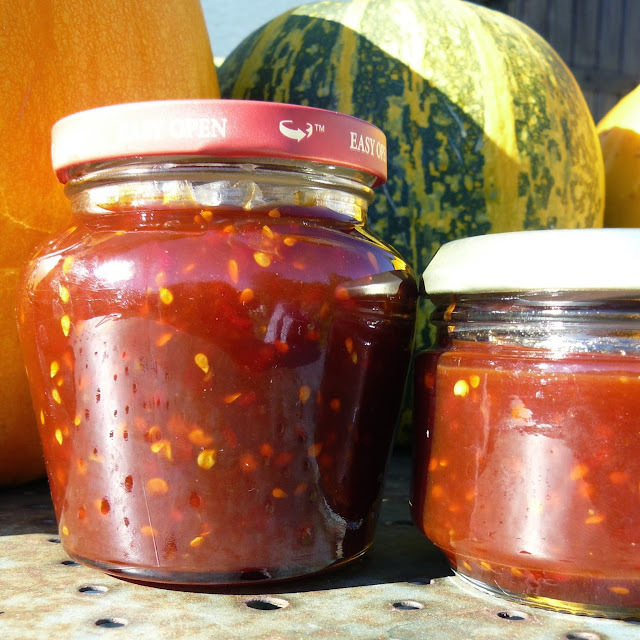 Here is another great tomato recipe, a sweet and hot tomato and chilli jam that makes a great marinade for meats, zings up a stir-fry as well as spicing up the Christmas day cheese platter. Chop the tomatoes and add to a food processor with the peeled garlic, the Soy sauce and the chillies (chopped but with seeds). Blend to a mush. Pour this and the vinegar into a large heavy bottomed saucepan and add the sugar. Bring to a boil, stirring continuously to dissolve the sugar. Once boiled, turn the heat to low and leave to simmer, stirring every 10 minutes to keep from sticking. It is ready to pour into sterilised jars when a channel remains on the bottom of the pan after stirring with a wooden spoon. For an alternative version with courgette (zucchini) rather than tomatoes, blend the chillies, garlic and soy sauce and add to 1kg grated courgette and the vinegar in the pan, then add the sugar and continue as above. 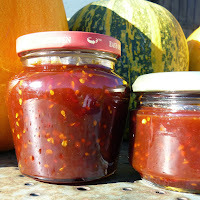 This obviously doesn’t have the deep red colour of the tomato version, it is more of a murky brown, but the flavour and texture are superb and it is another way of using up courgettes.